Dermal fillers help to diminish facial lines and restore volume and fullness in the face. As we age, our faces naturally lose subcutaneous fat. The facial muscles are then working closer to the skin surface, so smile lines and crow’s feet become more apparent. The facial skin also stretches a bit, adding to this loss of facial volume. Other factors that affect the facial skin include sun exposure, heredity, and lifestyle. Dermal fillers can be used to plump thin lips, enhance shallow contours, soften facial creases and wrinkles as well as improve the appearance of recessed scars Dermal fillers can be very helpful in those with early signs of aging, or as a part of facial rejuvenation surgery. There are several different types of dermal fillers. Dermal fillers differ in chemical make-up, longevity, and have varying degrees of softness. Softer fillers are used in the lips, for example, while sturdier fillers might be desired to enhance cheekbones. We will determine with you the best type and volume of filler needed for your particular areas of concern. For many people, the use of “off-the-shelf” fillers can be a simple office-based procedure that can nicely enhance your appearance. These dermal fillers are very predictable, and have relatively minimal risks and side effects. One of the most common fillers is hyaluronic acid because of its compatibility with the human body. Hyaluronic acid is a natural substance found in your body. High concentrations are found in soft connective tissues and in the fluid surrounding your eyes. It's also in some cartilage and joint fluids, as well as skin tissue. It is extracted and reformulated and now has become one of the most popular kinds of injectable fillers. If the term sounds familiar, it's because the same substance is often injected into the aching joints of people with arthritis to ease pain and provide extra cushioning. Brand names include Captique, Esthélis, Elevess, Hylaform, Juvéderm, Perlane, Prevelle, Puragen and Restylane. Hyaluronic acid is not derived from animal sources. When this gel is injected, it acts like an inflated cushion to support facial structures and tissues that may have lost volume or elasticity due to normal aging. It also brings water to the surface of skin to keep it looking fresh and supple. Newer filling agents such as Juviderm Voluma can be used to enhance cheek volume. Of note, in my practice, I do all if the injections myself. In many other offices, mid level providers do procedures such as fillers and botulinum toxin. If you choose to utilize packaged soft tissue fillers we will evaluate your facial appearance and skin tone and examine the areas of your face to be augmented. 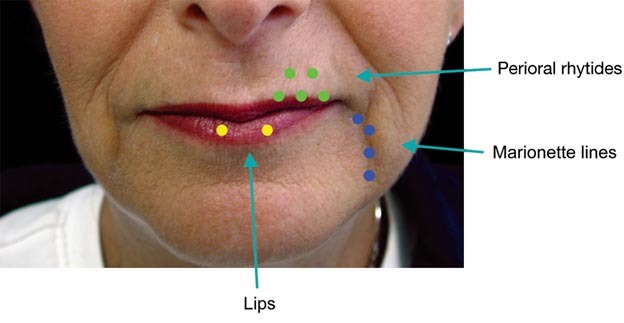 Strategic points on your face may be marked as the appropriate injection sites for the filler. Photographs may be taken of the areas to be treated. The injection sites will be cleansed with an antibacterial agent. Pain at the injection site may be ameliorated by use of an anesthetic ointment to numb the skin or injection of local anesthesia. While not painless, the injections are usually easily tolerated. Injection usually takes only a few moments per site. The process of injecting, massaging, and evaluating the result is performed, and additional filler added as needed. Depending on the number of areas to be treated, the whole process may be as short as 15 minutes, or as long as an hour. Common treatment sites for filling agents include perioral lip lines, nasolabial folds, marionette lines and for lip enhancement. Once the results are deemed satisfactory, any markings will be cleansed off. You may be offered an ice pack to reduce swelling and alleviate discomfort. Although the area may feel a bit tender for a day or two, it is usually not painful enough to require any medication. There is no downtime with dermal fillers. You can resume most activities right away. When your own fat is the injected filler, the healing process is longer and may take a few weeks. The decision to use fillers is extremely personal. You will have to decide if the benefits will achieve your goals and if the risks and potential complications of dermal fillers are acceptable. You will be asked to sign consent forms to ensure that you fully understand the procedure, as well as the risks and potential complications.